From Mezco Toys. Cable was sent to the Future in a bid to save his life when he was infected by a techno-organic virus. Using his formidable Telekinetic abilities and cybernetic enhancements, cable battles Super villain foes in his quest for peace. The one: 12 Collective cable figure features a body with over 30 points of articulation, plus a light-up function that illuminates his chest armor and techno-organic eye in both of his head sculpts! The Telekinetic Mutant features a newly sculpted cybernetic arm and is outfitted in a sleeveless shirt with chest armor, duty belt with gun holster, and a leg holster with knife sheath. Cable comes complete with a devastating arsenal of advanced weaponry. 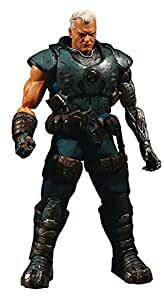 He also includes one (1) pair of fists, one (1) pair of posing hands, one (1) pair of gun holding hands, and one (1) pair of holding hands, plus accessories like: his knife, handgun, plasma cannon with two (2) removable magazines, grenade launcher with rotating carousel, and a base with a stand for easy display.